The German Soccer team isn’t the the world champion crowned this past weekend. 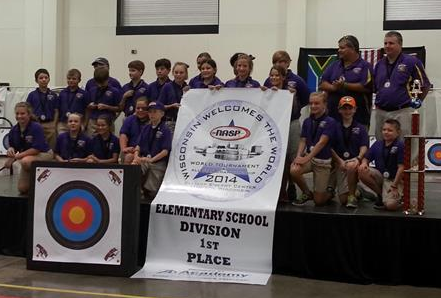 We are elated to announce Benton Elementary School’s archery team is the world champion. The 2014 NASP (National Archery in the Schools Program) World Tournament was held over the weekend, where Benton’s team of fourth and fifth graders competed against the best archers from across the globe. They faced off against teams from Africa, Canada, England and Mexico to name a few. When scores were tallied, Benton Elementary placed first out of the 30 teams, clinching the title of Elementary World Champions. Under the direction of Benton Elementary Archery Coach Perry Norcross, the team was named elementary state champions for 2013-14 and placed eighth in the nation in May at the NASP tournament in Louisville, Kentucky. To put their win in perspective, NASP is the largest youth archery program in the world. At the 2014 National Tournament, nearly 10,450 student archers competed, setting a new Guinness World Record. The 4th-12th graders represented 665 schools in 39 states. Benton’s win at Nationals earned them the right to compete at the world level. The pubic is invited invite to attend a celebratory pep rally in their honor at 5 p.m. Thursday, July 17, in the Benton Elementary gymnasium. Help us congratulate the Benton Elementary Tigers’ archery team and please make plans to attend Thursday’s pep rally!